In the year 2005, more than 200 children lost their lives in the U.S after having been forgotten in cars. It seems almost impossible that a parent could forget her child in the car. 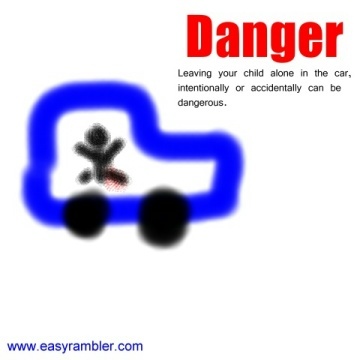 However the truth is that, many mums forget their children in cars for various reasons. The dangers of forgetting children in cars, includes both intentionally or unintentionally leaving a child in a car. A mother drives her baby to the shop down the street. She rushes into the bank to get some work done, the child is all alone in the car at that point of time. It is a hot day and the mother turns on the air condition in the car. There is a large queue at the bank, the mother has to wait longer than she anticipated. The toddler in the car grows restless, he starts to play with things in the car. He accidently pushes the air conditioner switch and this turns the unit off. The car starts to heat, the toddler faints. The mother returns from the bank and rushes her child to the doctor. There are dozens of cases where children are left alone cars, many accidents go unreported. In this safety related article, we talk about children being left alone in cars and suggest ways to reduce this occurence. One important thing to understand is that, there are cases where parents voluntarily leave children alone in cars. In this case the act of leaving the child alone in the car is not accidental, the parent chose to leave the child unattended. If the law does manage to reach it's arm to such incidents, it should first of all come down heavily in cases where parents, baby sitters or other elders intentionally leave a child alone in a car. A mother drives her 1 year child to the post office, she leaves the engine turned on and lets the child sit alone in the car. Expecting the work at the post office to take no more than a few minutes, the mother leaves the child alone in the car. It is a cold winters day and the heating system in the car has been turned on to keep the child warm. The child starts getting bored or scared after sitting alone in the car for few minutes. Like a normal child, he finds something interesting to play with and in this case plays with the colorful keys of the heating system. The system turns off and the car starts cooling due to the cool weather outside. The mother comes back about 5 minutes later and notices that the child is almost unconcious. She rushes the baby to the doctor who just manages to save the child's life. Incase we forgot to mention, the mother did shed a few tears probably to wash away the feeling of guilt! Here is another tragic story, this one did not end so well for the child who was left alone in the car. This is yet another case where the parent intentionally left the child alone in the car, it had nothing to do with being forgetful. The mother drives the child to the bakery, it is a hot and humid day. The child is left alone in the car with the cooling system turned on. The child gets restless as the mother has been away for almost 10 whole minutes. The restless arms and legs of the young child strike the switches of the cooling system, the system shuts down. The temperature inside the car keeps rising, the hot sun makes things worse. The mother returns a few minutes too late and sees that her child is dead. The truth is that, leaving a child alone in the car can be dangerous irrespective of it being intentional or accidental. However there is no denying the fact that accidents where children are intentionally left alone in a car, can be easily avoided. All would have been fine if the parent or elder commiting this horrible act would show more care and compassion for the child. Let us now ramble about cases where children were accidentally left alone in a car. The results can be just as disastrous so we cannot take such 'accidents' lightly. A mother drives her baby to the baby sitter's home (more like a creche). The child is asleep in the back seat of the car. The mother intends to drop the child at the creche and then drive on to work. Half way through the drive, there is an urgent call from the office. The morning meeting has been preponed and she is expected to make her presentation in the next 30 minutes. Forgetting about the baby asleep in the back seat, she drives straight to the office and parks the car in the parking lot. She hurries out of the car and rushes to the lift, the baby is now asleep and forgotten in the car. After an hour, the mother gets a call from the father, he wants to remind her to ask the creche to keep orange and citrus juices away from the baby. The mother then remembers the baby and rushes to the parking lot, fortunately the baby is safe. Another interesting and almost unbelievable story related to children being forgotten in cars. A family with 3 children heads off for a holiday at the beach. The youngest child is less than a year old. The family drives back home in the evening, the two children jump out of the car, the mother carries the picnic bags and other stuff back into the house. The father drives the car into the garage, parks it and downs the shutter. The youngest child is fast asleep in the car, the family safe and sound at home. It was only an hour later that the mother noticed that the child was missing. They check in the garage and the child is seen feebly banging at the door of the car. The doctor needed an entire night to look after the child and ensure that she was out of danger. In June 2011, The Times Of India one of the country's leading newspapers, reported a tragic incident. A young kid was left alone in the car as the family were busy preparing for and celebrating a wedding celebration. A mechanical fault in the door of the car is believed to have prevented the child from opening the car. The automobile had dark tinted glasses that made it tough for anyone outside to notice the kid who died of suffocation. We do not have any statistics to show the number of neglectful and heartless parents who have been legally tried for such offences. It is not easy to prove and prosecute such cases in court. Even in the worst of cases where the child dies, there are numerous activists who claim that sentencing the parents in court would not bring the dead child back. If this is a reason for letting the parents go free, murder would be the best way to settle any dispute between people. Let us now discuss ways to reduce or even eliminate such sad disasters from occuring. The main thing is that elders and parents need to understand and feel the dangers that their actions can bring. Children continue to be exposed to such dangers, people keep wondering how parents can be so cruel, the law continues to be shy when it comes to such cases. The cases where parents or elders intentionally leave children alone in cars can be remedied quite easily. Stop doing this and if you know someone who is doing this, send them the link to this article and let them realize how dangerous it can be. People who continue to leave children alone in cars even after reading this article, should be shunned by society. Now coming to ways to reduce the possibility of forgetting a child alone in the car. If you leave your baby in the baby seat on the back seat when driving, keep the nappy bag or anything belonging to the child on the front seat next to you. It is very likely that you would notice the bag and be reminded of the baby in the car. Paste a neatly printed sign below the car door handle near the drivers seat, let it clearly and boldly say "DO NOT FORGET THE BABY'. Technology has also come to the help of forgetful parents and elders. An interesting device is the two part alarm, one portion fits on the baby seat in the car. The other portion gets attached to your key chain. When you get down from the car and walk away, a beeping alarm will be sounded if the distance between the two parts of the alarm is more than a few feet. The idea is that, the portion from the baby seat needs to be taken off the seat and locked into the portion attached to the key chain. This is ofcourse helpful only in cases where the child is accidentaly left alone in the car. This ramble on leaving children alone in cars has two objectives. The first and most important is to make people aware of the dangers. The article then discusses ways to reduce such accidents. Email us at easyrambler@rocketmail.com with any comments that you might have.